I have written before that, of all the media, podcasting might be THE most diverse. The audience is pretty representative of the population, which seems a good thing… I’d like to see it remain that way. FULL DISCLOSURE: I have a deep dislike of most “segment politics” as the practitioners are predominately disingenuous. Just so you know where I’m coming from. At one time, the computing industry offered ONLY “proprietary systems”, computer hardware and software that, effective as it may have been, was available from only a single source — the manufacturer — and you were locked in for the duration. Although it took years for the transition to take place, the obvious competitive advantages of “open systems” forced the industry as a whole to adopt a different approach. Rather than being exclusive, expensive, private resources… computers became cheap, generic, powerful, and public. It was a sea change. In the past, many businesses and industries were exclusionary. They practiced “closed” methods as a means to dominate the marketplace and control the consumer. They played defense more than offense. Building unnecessary walls proved to be a serious strategic flaw, however. When smaller competitors began offering the flexibility of open systems — customers flocked to them — and the major manufacturers fell hard. In our current culture, openness is highly valued. Unless there is some reason inherent in the product or service (after all, some things are for some very specific purposes), industries want to have everyone as their customer — excluding none — and certainly not for arbitrary reasons like gender, race, ethnicity, religion, sexual orientation, and so on. In theory, business should be blind to such things. The podcasting industry is “open”. There is a very wide social demographic range of both podcasters producing web media content and podcast listeners consuming it. If the total podcasting audience roughly reflects society — which it does — what is the problem? Listeners can access podcasts on computers and phones, devices much of the public has. It doesn’t cost anything to listen to podcasts. It doesn’t require being accepted as a member or going to some designated location to meet. There is no significant impediment keeping any given segment of the population from enjoying podcast content. Podcasts are accessible regardless of race, gender, etc. When the consumer side of podcasting is examined, the picture looks full. 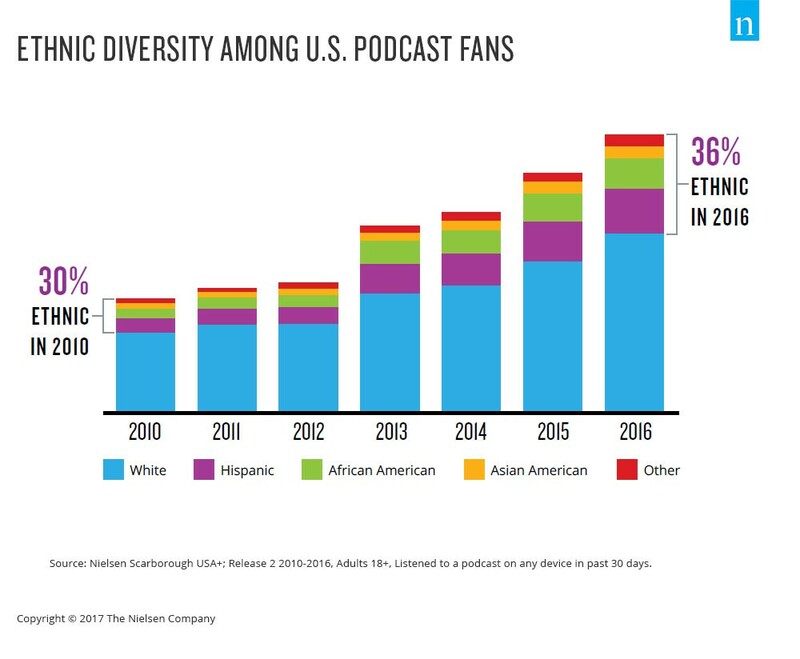 DOES diversity in the production side of podcasting matter IF the content attracts a diverse audience on the consumption side? Seriously. IF all the podcasters were of Asian descent yet their total audience was truly diverse, is something actually wrong? In this scenario, the lack of diversity in podcasters would certainly be curious! If it was determined that a “podcasting license” required a check in the “Asian” box and approved by an unbending bureaucrat, then that is an inherent, unfair hurdle… an arbitrary obstacle. But there is no such license or hindrance. The diversity of listeners themselves would prove THEY don’t have an issue it. I should just stop here since, ultimately, the audience determines the outcome. Would it be unusual if an Asian podcaster with an Asian-themed podcast had a mostly-Asian audience? No. It makes sense. Plus, there still may be non-Asian audience members, so they are not excluded… just not the majority. At the same time, would it be odd if an Asian podcaster had a generic podcast theme (say, parenting) and a perfectly diverse audience? No. That makes sense, too. So, it would seem diversity of consumption has more to do with TOPIC than the podcaster creating the content. This side-steps the anomaly of celebrity, which can throw any assumption out the window. A social magnet has its own powers that pull in mysterious ways… topic for another day. In the real world, there are very few barriers to entry in the podcasting space. It doesn’t cost much money nor require access to big media resources. Today, there is very little holding back anyone in the world from launching their own podcast. I believe it is the most democratic medium there is. DOES diversity in the production side matter IF there is nothing preventing an individual from podcasting? The opportunity to be a podcaster — to create a podcast and express your ideas — is open to all. Perhaps that is why I feel somewhat protective of the space. I don’t want it spoiled. There are many individual stories to be told… shared… heard… learned. IF the audience is diverse, does the background of the podcaster matter? Are the social characteristics of the podcast producer material to the discussion? Any single podcaster only possesses one ethnicity, gender, etc… yet can appeal to those who are different. In the best of worlds, isn’t that how it is supposed to be? IF that is true for one podcaster, it is just as true of a GROUP of podcast producers. No matter the makeup of that group, if the audience of their output is diverse, is there an issue? IF a big successful podcast were produced by, say, ALL WOMEN… yet appealed to a solid sampling of the total population, including males… does that mean there is something to be fixed? I don’t think so, certainly not for that reasoning alone. In fact, those producers should be applauded for doing a good job producing content that is broadly popular. Wasn’t that the goal? One could even argue it’s a greater accomplishment by a team than an individual. Still, some persist in trying to find a smoking gun where there is likely none. Indeed, a pillar of the audio content space and respected in most ways social… it makes you wonder. The problem with getting a lot of smart people in a room and presenting them with some data and asking such a question is… they will try to find a problem. And even propose ways to fix it. Why does Ira Glass find it “disturbing”? Does he feel he’s done something wrong? If anything, he seems to have demonstrated open support of women in building his team and, to my knowledge, no women have alleged any kind of oppressive work atmosphere. None of the “players” appeared to be aware of a problem. In fact, most people have a very positive impression of the operation. So, IS there a problem? NOTE: I’m not saying ignorance is bliss. An interested external examiner, applying presumably sound science on reliable source data, now arrives at the conclusion that This American Life content, created by a staff of 12 women and 9 men, is statistically skewed about 65% male. Leans too heavy male. Suggesting it should be a 50/50 ratio according to the sexes. Alluding to a need for remediation. Yet the situation is actually only 15% “out of balance”. A shift of that much (from male to female) is all it would take make it even. Perhaps a change of that size would not be hard, maybe even achievable… but needful? If the imbalance was say… 90/10… really dramatic… that could well indicate some systemic problem. When you get less than 75/25, maybe that’s just the way things evolved (without any underlying motives). When trying to achieve goals in the business world, regardless of the metrics, getting within some REASONABLE range is not generally cause for considerable alarm. There are exceptions where tolerance is critical, to be sure, but in most general cases 15% MIGHT be looked at as “in the ballpark” and not indicative of impending doom. Where I have a big problem with demographic zealots is they seem to want digital precision in an analog world. If things are not EXACTLY divided according to race, religion, whatever… they want it “set right”… when, in reality, if things are “close enough” that is “good enough”. Any attempt at overly detailed correction is futile and never ends, it becomes a constant swinging of the pendulum and after-the-fact interventions; not active, reactive. This doesn’t even get into the likelihood of unintended negative consequences along the way, either. If, however, there ARE substantial demographic differences… the first step is to determine whether there is a legitimate reason (there ARE some) and if not, whether the problem has any hope of being fixed (sadly, some situations cannot be resolved). Only after that analysis should there be any discussion about the time, effort, and potential outcomes of “fixing” things to determine whether any action is worthwhile. Rather than look at the content gender issue at This American Life as a problem to solve, let’s try to determine how it came to be. You know how content producers talk about “voice” and “authenticity” when describing their work? Consciously and not, these people naturally guide the personality of the show in large and small ways. Perhaps, when creating this particular show, the voice that resonates in their individually-male-and-female-yet-collective-unisex-mind is… male. Could it be that the statistical fact a dominant, respected show content would skew somewhat male is only significant to the extent it describes the show? That it says nothing of the people who make it or the organization behind it? That its success vouches for the audience not perceiving a problem with the circumstances? So, perhaps the “study” simply found this particular show leans male. Just as there are other shows favoring the female voice. Podcasting is about freedom of opportunity. Virtually anyone CAN become a podcaster. The opportunity is present. Yet the outcome of their effort is unpredictable, a new podcaster’s content might become celebrated or silently fade into the ether. Like most things, the difference depends on both the amount of effort and the exercise of skills. Nobody is guaranteed a positive outcome. Everyone is granted a chance. That is all. The last article was about one kind of audience behavior: Hate Listening. Again, I truly appreciate the time you spend reading and thinking about my writing. Also, if you have some skills and are interested in my development project, let’s talk!